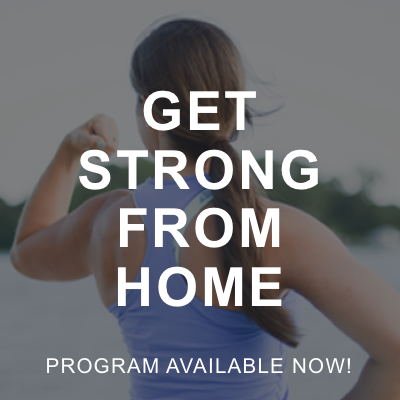 Following a paleo lifestyle, and still need some magic in your life? 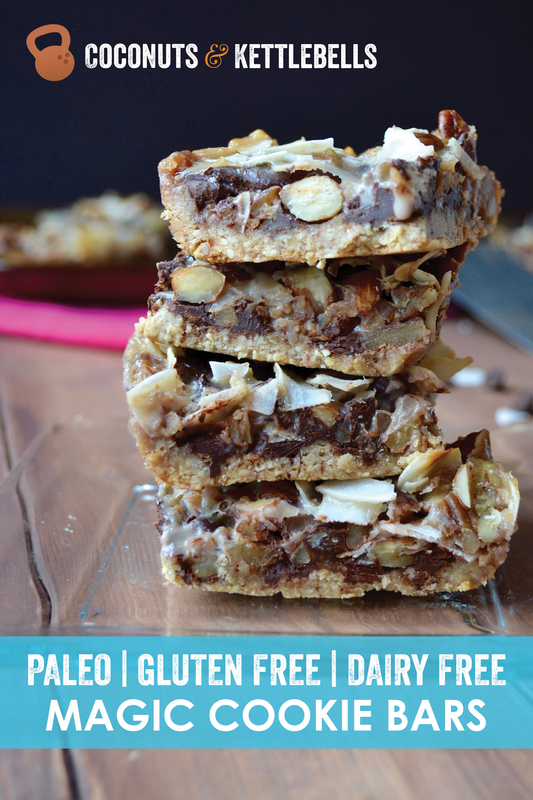 Then these paleo magic cookie bars are just what you’re looking for. This past holiday season, I really wanted to provide a special dessert at our family gatherings that was grain-free and dairy-free, and no one would suspect was void of processed ingredients. This was a tall order since the cakes and homemade magic shell concoctions I typically make don’t have the same appeal to my non-real foodie counterparts. So, of course—I took my challenge to the Pinterest database, and ended up stumbling upon magic cookie bars, also known as seven layer bars. 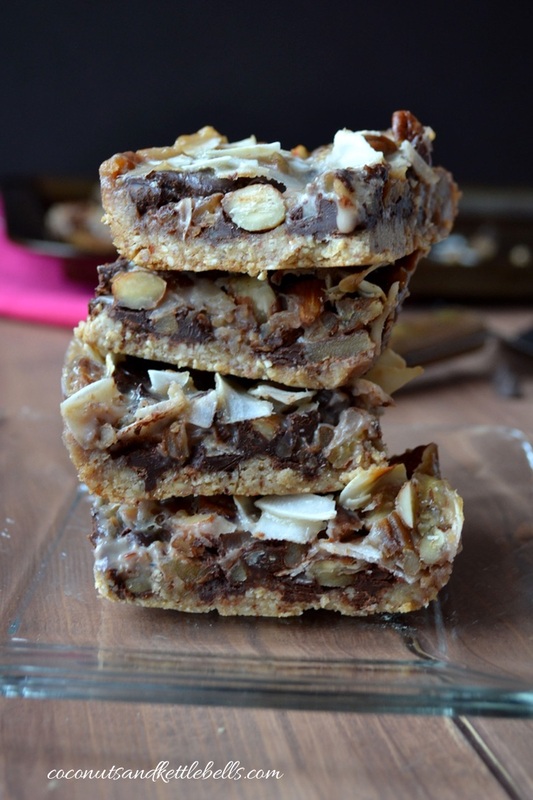 I could immediately tell magic cookie bars could easily be made grain-free and dairy-free, without sacrificing taste. After experimenting with creating a “condensed” milk from coconut milk, and using the perfect amount of cashew meal for the crust—I do have to say, this magic cookie bar recipe totally knocks it out the park. In fact, they were such a hit with friends and family, it was kind of a drag because there wasn’t any leftover for us to hoard to ourselves post-holiday. Oh, the perils of success. If you’ve never tried making a condensed milk with coconut milk before, don’t be intimidated. It truly couldn’t be easier as long as you follow the instructions, and consistently stir. 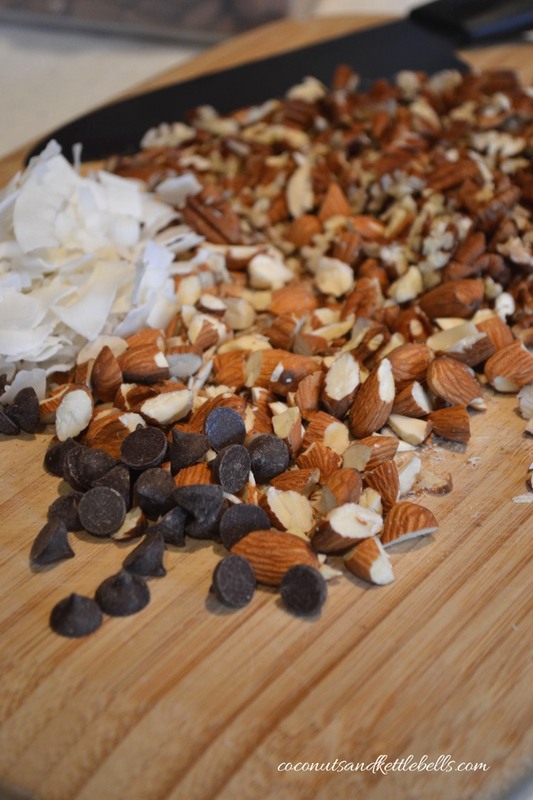 Also, if you have a different nut meal on hand, you can easily substitute them into the recipe. The combination below is what I’ve found works best in terms of texture and flavor. And lastly, I highly recommend getting unsweetened coconut flakes as opposed to shredded coconut for the magic cookie bars. 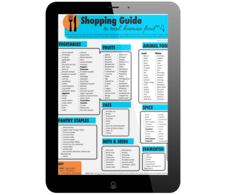 These can easily be found at your nearest organic grocery store. The larger coconut flakes give the magic cookie bars a much crunchier and thicker texture, which is what makes them taste so incredibly delightful and indulgent. These sweet and decadent paleo magic cookie bars are tiny squares of heaven the whole family will love. In a heavy saucepan, heat the coconut milk, honey, and vanilla on medium heat, stirring occasionally. 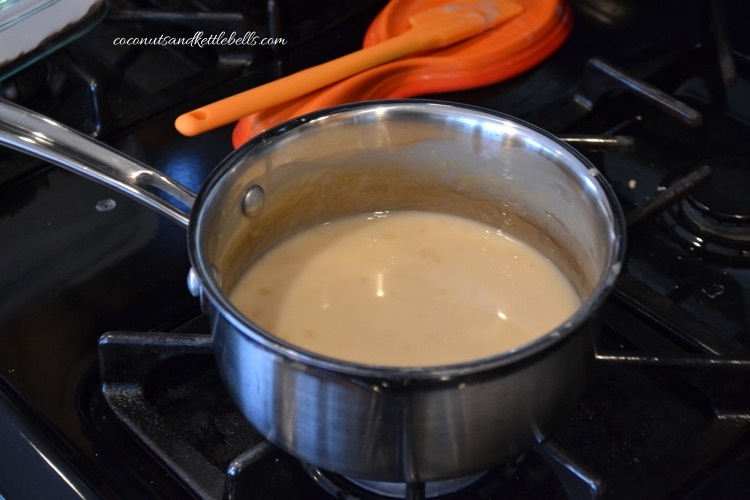 Once caramel mixture starts to boil, reduce heat to a simmer. Stir mixture every 3-4 minutes until it reduces by 1/3 to 1/2 (about 25 minutes.) If sugar sticks to sides, stir to combine again. Once coconut milk caramel has thickened, remove from heat, stirring just before pouring over bars. While the caramel is simmering, mix the almond flour, cashew flour, salt and cinnamon until well combined. Heat honey and coconut oil in a separate bowl until liquid, and stir. Add liquid mixture to the dry mixture until it forms a crumbly dough. With a spatula or your hands, press the mixture down evenly, covering the bottom of a parchment-lined 8×8 baking dish. Bake at 350 F for 10 minutes. Allow crust to cool for 2-3 minutes before topping with ingredients. Sprinkle ¼ cup chocolate chips evenly over crust, pressing the chips into the crust. Sprinkling the remaining chocolate chips, pecans, almonds and coconut flakes evenly over crust, saving 2 tbsp coconut flakes for garnish. Pour coconut milk caramel over everything, and garnish with remaining coconut flakes. If you don’t have cashew flour, simply use almond flour. 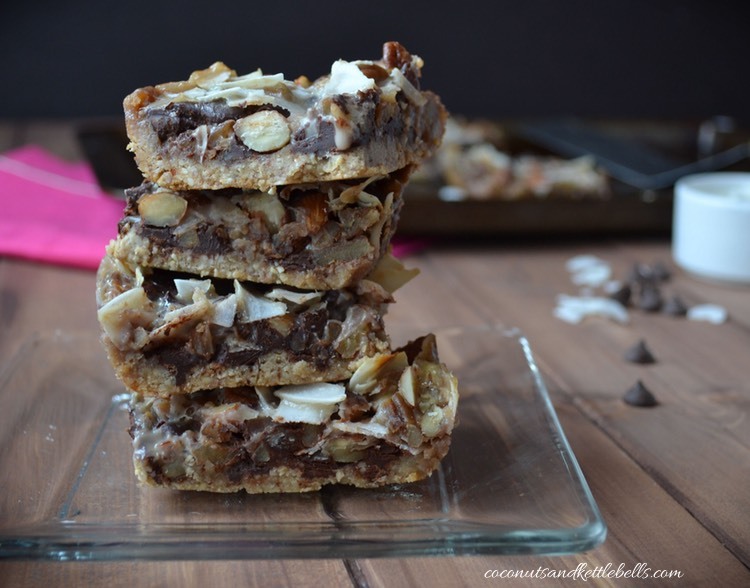 Have any questions about this paleo magic cookie bar recipe? Ask away in the comments below! Great tip about using coconut flakes in the recipe, I can see how good the cookie bar texture would be just looking at the photos 🙂 Delicious! Pinned and sharing this week. Holy crap Noelle!! this is amazing!! Love the idea of creating a condensed milk with coconut milk too. I’m a little bit scared to make these because they seem like they’d be so ridiculously addicting 🙂 Love it! Tip: Make them for a special occasion! 🙂 This is what I always do. Just found you, and I am thrilled. Looking forward to perusing your past blogs and recipes and trying out this one. I am gluten intolerant and this reminds of the old “Hello Dolly” recipes from 45 years ago! Thanks so much for this recipe! Can’t wait to try it and wonder if I could substitute xylitol for honey for my diabetic friend? Will that change the texture? Hi PC! It’s possible. However – I’ve tried it without honey and I prefer it with. 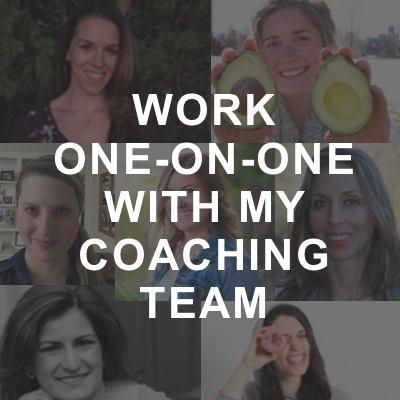 Let me know what works out for you! I watched you make these on Periscope and it looked so good. 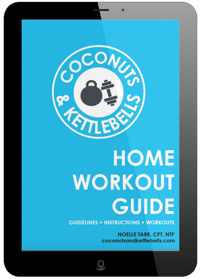 Can I use Coconut flour instead of Cashew flour? Hi Dawn! Actually, no. Coconut flour can not be used in place of other flours. Coconut flour is very dry, and expands. I’m sure you can use it, however, you’d need to up the liquid ingredients, and reduce the amount of flour you use. Hope that helps! Just made these last night. They are delicious! Mine came out with a little too much moisture and are not holding together as well as I hoped. Basically, they look like yours from the side but the top looks a little gooey. Especially on the sides. Do you think the coconut milk did not condense enough? I really want to make them again because the taste is wonderful. Thank you! 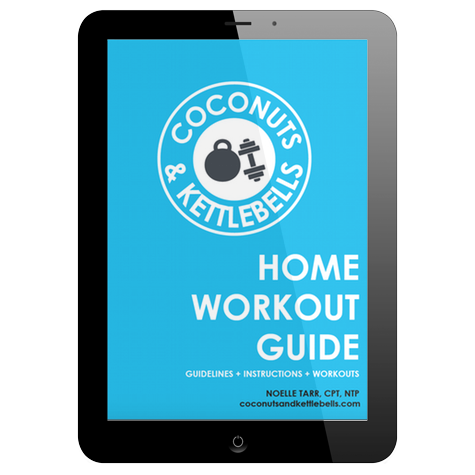 Yeah – I would let the coconut milk condense more so that there is less of it. Seems like there wasn’t enough “filling” and too much milk. Hope that helps! Just watched you make these on Katch. looking so delicious, i’m gonna try these!! wondering if the dough easily crumbles apart, you think using also eggs would keep the dough glued together? Hi Sven! Good news – It’s actually not crumbly! 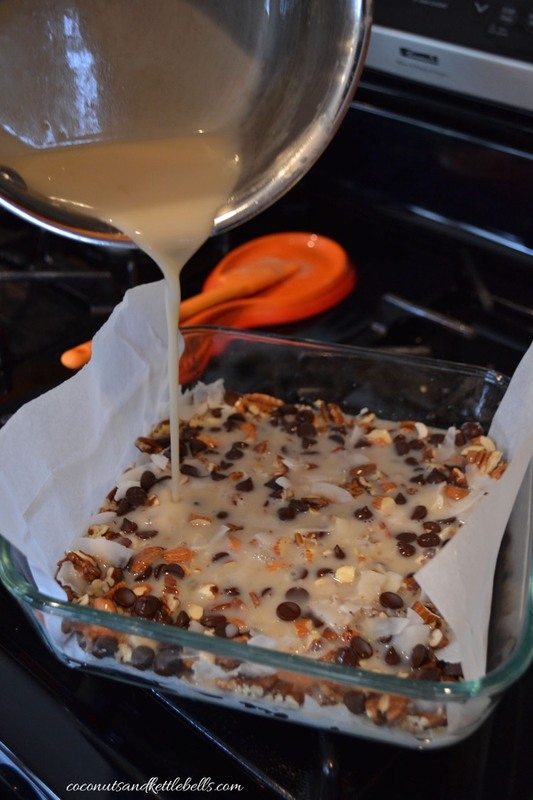 When you pour the condensed coconut milk overtop and bake it – it makes it stick together! 🙂 Let me know how it goes! Sounds so yummy and I have all the ingredients! Aweeesome! 🙂 You’re going to love them! If I put some raw cashews in the food processor and pulse them into a fine meal would that work for the cashew flour? If not is there another substitute? Thanks. Absolutely! That’s exactly what cashew flour is. Just make sure to stop before it turns to cashew “butter.” 🙂 If you don’t have cashew flour on-hand, simply use almond flour in its place. Hope that helps! I just made these for a potluck and they are the BOMB (obviously I had to do a little quality control). Even my paleo dessert agnostic husband loved them! I used almond meal and a little bit of coconut flour for the crust. YAY! That’s awesome. I have the same experience… which is why I always make this for holidays and potlucks with non-paleo people. SO glad you loved them. Thanks for sharing! Woweee, do these look yummy!! Glad to have found your site! It’s just what I need right now! Thank you! ???? Wondering if anyone has used the sweetened condensed coconut milk purchased in a can for these? I have two cans I bought out of curiosity and am hoping they aren’t too thin to use. Thanks! I haven’t… but I think it would work! Wow! 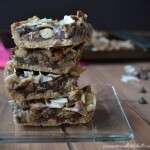 I am pretty excited about this recipe since magic bars used to be one of my absolute favorite things! Thank you! Would you recommend freezing these? You definitely could! I would make sure that it’s sealed. 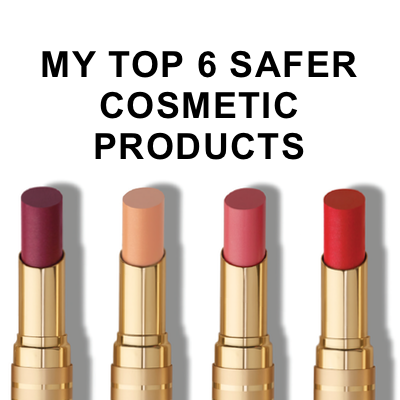 My only concern would be the condensed cream. Thank you thank you thank you!!! 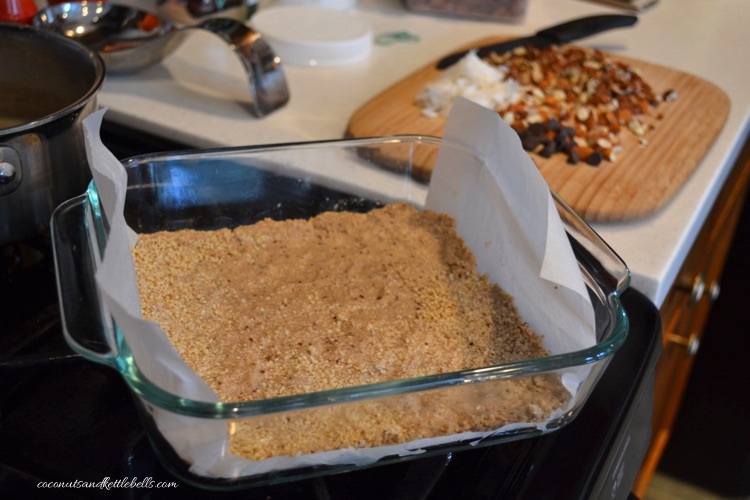 Maguc bars may just be one my favorite things ever, so if I can make a healthy version, count me in! You are so welcome! You won’t be disappointed. Just made these to bring for Thanksgiving. For the first time ever I found organic sweetened condensed coconut milk. Talk about a time saver. This recipe turned out fantastic! Thank you! Do you think I could sub maple syrup instead of the honey or would it be too liquidy or not set properly? I think you could actually! I haven’t done it personally with this recipe but I do it often with others.